Technological solutions for every building. We are a provider and developer of individual custom automation solutions for any types of buildings and industrial complexes. With every our project we adapt and work hand to hand with our customers to engineer the solution that is needed. We incorporate all of our innovations and also come up with many new ones. Our projects extend from simple automation systems and all the way to toughest engineering creations. We simplify the experience for our customers, by putting all of our development knowledge into the solution and just make it work. We are using our own smarti TCP/IP relay boxes, smarti TCP/IP dimmer boxes, wall mounted touch screens, smarti PLC controllers etc. combined with custom software interface solution to create a simple to use and intuitive, yet powerful system environment. 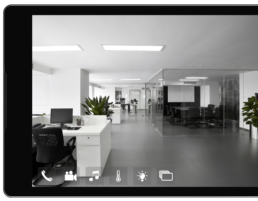 All of our advanced systems can also be integrated in any building automation solution. That way we can achieve the perfect correspondence between comfort and more complex engineering strategies. In our building automation solution segment we are providing management of all kinds of applications. As a vital part of our solution there are included temperature and humidity settings, ventilation and other ambient controls. We are also incorporating light and shade management combined with multimedia, video intercom as well as security systems features. For the building access we can deliver our state of the art access control and time & attendance systems. The entire solution can then further be completed with advanced scenes and schedules. Besides all that we can also contribute with complex and other connected solutions tailored to every individual costumers requirements.